Fausch conveys elegantly his reverence of rivers in this clarion call for conservation. In For the Love of Rivers: A Scientist’s Journey, Kurt D. Fausch weaves stories and insights from a career immersed in the ecology of rivers with lyrical and deeply felt reflections on what these flowing waters mean to us and what will be lost unless we learn to care for them. 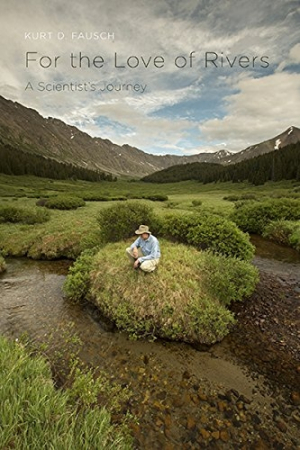 A professor in the Department of Fish, Wildlife, and Conservation Biology at Colorado State University, Fausch has engaged in extensive research that has taken him from Michigan through the western United States and parts of Canada, and as far afield as Hokkaido, Japan, where his experiences were recorded in the PBS documentary River Webs. More than a science book, For the Love of Rivers also chronicles something all too rare in the world of scientific research: the deep and enduring friendship of Fausch and his Japanese colleague and mentor, Shigeru Nakano, which transcended cultures and time zones until Nakano’s tragic death in a storm on the Sea of Cortez. Fausch, in knowing that we will protect only that which we love, issues a compelling call to love streams as he does, “for their shimmering runs and curling eddies, their riffles that speak a language that we once knew … for the mists streaming from the bends, turned bright by the rising sun on crisp fall mornings, and the jeweled dew falling cold on your neck as you thread through the willows.” He speaks with reverence of the colorful, intricate, and complex plants and animals that inhabit a river’s ecosystem and the raw power of the stream as it moves against shins and thighs, even as he mourns the tragic loss of so many streams and their animals, both in Japan and western North America.